Beginning August 30, 2018, new rules will be in effect for California Proposition 65 labels and signs. ComplianceSigns.com has developed signs and labels to meet the new Proposition 65 signage requirements. Use our new Prop 65 sign selection tool below to find the new signs you need, quickly and easily. What's Changing on Prop 65 Signs? Most signs will now require the WARNING symbol (triangle with exclamation point) along with the word “WARNING” and an associated Prop 65 website address. In addition, updated Prop 65 signs will require specific chemical names and, in some cases, sources of exposure. We now have new Prop 65 signs and labels available so you can meet the August 30, 2018 deadline. Once you have your updated signs and labels, they can immediately replace the old versions and will be fully valid. Get more information on Prop 65 sign rules below. Search by CAS Number or chemical name, or choose the first letter of a chemical name from our A-Z list. We will show you a list of Prop 65-listed chemicals. No need for an advanced chemistry degree. Select your Chemical to see all signs for that chemical. Choose a Sign to see details. If your sign requires a source of exposure, you will need to provide that information so we can print it on your signs. Pick Your Quantity and Go! 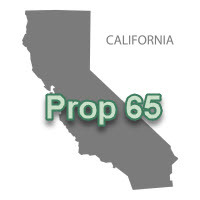 Just add the item to your cart and continue shopping for each new Prop 65 sign you may need. Companies doing business or selling products in California are required to provide "clear and reasonable" warnings before knowingly exposing Californians to certain chemicals the state has identified as hazardous. This warning can be given in several ways, including labeling a consumer product, posting signs at the workplace, distributing notices at a rental housing complex or publishing notices in a newspaper. The California Office of Environmental Health Hazard Assessment (part of California EPA) publishes the official Prop 65 list of chemicals known by the state to cause cancer, birth defects or other reproductive hazards. The list contains a wide range of naturally occurring and synthetic chemicals. A business must use knowledge of its business operations and the chemicals it uses to review the Proposition 65 list to determine whether its operations or products are likely to expose people in California to any listed chemicals. Depending on the level of exposure, the business may be required to provide a warning for those exposures. You Probably Have Questions - We Do Too! Unfortunately, there are very few answers. 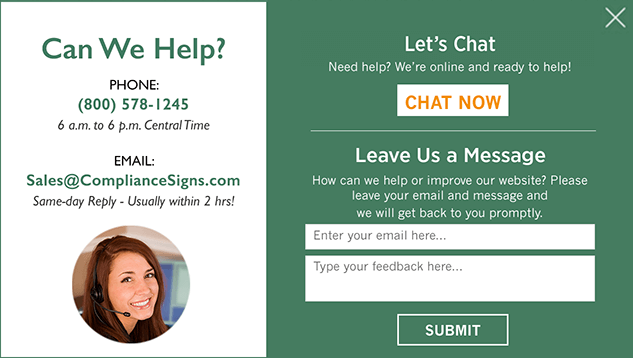 ComplianceSigns contacted the OEHAA (Prop 65 Office) and we were directed not to give any advice on whether a sign is correct for a particular location or application. Other questions with no clear answer include: What is the correct way to describe exposure sources; How many signs are required; and Who enforces the new rules. You must make the decision on sign necessity and content based on your knowledge of your business, the types of chemicals that are present and the approach you take to comply with the new Prop 65 regulations.